The Pre-Licensing courses are State approved and comply with State Education Requirements for Licensure. 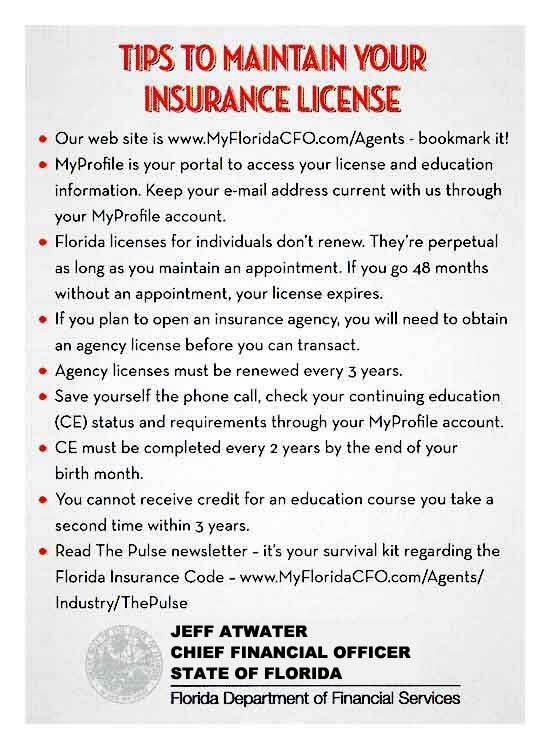 Once the student has successfully completed the course and final examination, his/her name will be sent to the State of Florida Department of Insurance indicating eligibility to sit for the State licensing examination. No classroom required! Become a licensed insurance agent without the loss of production income and time. Work at your own pace with your instructor who is available by email or telephone. The 40 hours of credit are earned completely online in the virtual classroom. Upon completion you are eligible to take the state examination. It is designed and taught to comply with the State requirements for Life, Health and Annuity education prior to the State examination. Topics include Federal and State Regulations, Legal Concepts of the Insurance Contract, Life and Health Insurance, Annuities, Health and Accident Insurance, and Disability and Medical Reimbursement (view syllabus). Upon enrolling, you will be notified of course procedures by email within 1 business day after receipt of registration. Enrollment is for 3 months. 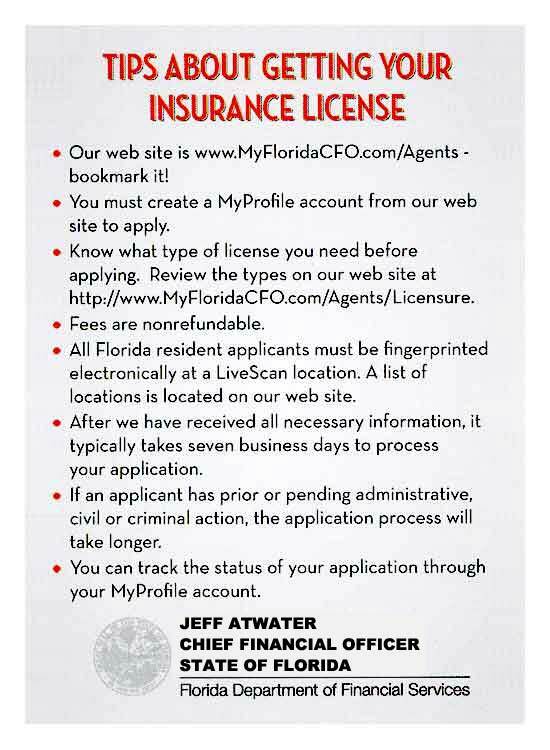 Review State of Florida licensing requirements. Required Text: Florida Life, Health & Variable Annuity Study Manual, current edition. May be purchased from OLT's Bookstore. This 200 hour state approved pre-licensing course is offered entirely online including the course final exam. Upon successful completion of this course you will be eligible to sit for the state examination. Work at your own pace with your instructor available by email or telephone. It is designed and taught to comply with the State requirements for the General Lines Agents State examination. Topics include Automobile, Property Insurance, Inland Marine, Crime, Workers Compensation, General Liability, Health Insurance, Aviation and State Law (view syllabus). Upon enrolling, you will be notified of course procedures by email within 1 business day after receipt of registration. Enrollment is for 6 months. Required Text: Florida General Lines Agent and Customer Service Representative Study Manual, current edition. May be purchased from OLT's Bookstore. The success of any personal encounter in the business world begins the second someone lays eyes on you, often long before either of you says a word. A professional image - appearance and behavior - helps start the experience in the right vein since people decide 10 things about you within 10 seconds of seeing you. Learn the art of impression management, equally applicable to men and women, so you know how to determine what impression you want to make and then how to look and act to get that reaction. You tell others how to treat you. Your business associates and co-workers mirror whether you want to be treated as Number One or Number Ten no matter your level. It's time to take charge and positively impact your career! Cradle-to-grave job security is gone. Building relationships is your key to controlling your career, your business and your destiny from your first job until you retire. You have one thing in common whether you are self-employed or work for someone else: People like to do business with and hire people they know and trust or people referred to them by people they know and trust. To be “the” one to get the sale or the job, you need to create, develop and maintain relationships with the right people to build social capital. Just knowing people is not enough! More than ever, you need to hone and enhance your networking and communication skills to make your interactions meaningful and you memorable. This series, based on what you do before you work an event, at the event and after the event, was created by the woman the Chicago Tribune calls a networking expert and the Association Forum of Chicagoland calls the business networking authority. Building social capital is key to amassing financial capital. Advanced degrees and experience won’t help you get ahead when you lack “knob turners” to get you the appointment or interview. You invest money and earn interest to get more money; this process is about investing time to gain more contacts to build a new kind of wealth: relationships. You’ll get an in-depth look at what constitutes networking, the noun that has been turned into a verb and is a mainstay in business worldwide. Then you’ll start the networking process at the beginning by learning more about your natural networking strengths and limitations and improve your interpersonal knowledge as you also learn what makes others act and react the way they do... and, importantly how to improve your interactions with them. This first course in the series will lay the foundation for building relationships that last. Prerequisite: While not absolutely necessary, it will be helpful for you to have taken "Laying the Relationship-Building Foundation" in this five-part "Building Relationships for Business and Career Success" series. Your initial words in any face-to-face networking interchange are so important that you need to craft them so they inspire, inform and intrigue others enough that they want to know more about you. This course leads you through the process of creating your Verbal Business Card, the front end of your elevator pitch, which also serves as the basis of your top-of-the-mind positioning statement, a must for every business person. It also gives you vital delivery tips that lead you into meaningful conversations so you will be memorable later. Your Printed Business Card also plays a crucial role in your relationship-building activities because it is often the first impression of your business. This course also provides myriad tips on how to create and use this powerful tool. Prerequisite(s): While not absolutely necessary, it will be helpful for you to have taken "Laying the Relationship-Building Foundation" and "To Catch Trout, Don’t Fish in a Catfish Pond" in this five-part "Building Relationships for Business and Career Success" series. You can do your homework, yet nothing can simulate actually working an event. This is when reality hits, and you have the face-to-face opportunity to build or strengthen relationships that will help increase your sales or get you the job or promotion you want... or to miss the chance because you don’t know networking etiquette or didn’t engage in meaningful conversations that made you memorable. There’s so much more to working an event than just showing up. This course details what to do from start to finish, giving you the framework to adapt to your style so you can succeed much more easily. Prerequisite(s): While not absolutely necessary, it will be helpful for you to have taken "Laying the Relationship-Building Foundation", "To Catch Trout, Don’t Fish in a Catfish Pond", and "Create Effective, Powerful Verbal and Printed Business Cards and Know How to Use Them Effectively" in this five-part "Building Relationships for Business and Career Success" series. You did your before-the-event preparation. You worked the event with ease, and now you have a handful of business cards. What do you do next? You follow up, of course! You’ll learn how... from the importance of collecting and recording information on business cards for populating your database to follow-up methods from email, handwritten notes, e-zines or newsletters to the time-proven telephone calls, business meals and referrals. You’ll also learn how to recognize and respond online and on the telephone to the four styles of behaviors I described in detail in the first course. Prerequisite(s): "Laying the Relationship-Building Foundation" is mandatory. It is also strongly recommended that you have completed "To Catch Trout, Don’t Fish in a Catfish Pond," "Create Effective, Powerful Verbal and Printed Business Cards and Know How to Use Them Effectively," and "Work an Event With Ease" in the five-part "Building Relationships for Business and Career Success" series. This will have given you the basis for what to do before and during an event. Includes access to all five of our GED courses (below). This course prepares you to pass the GED Writing Skills Exam and teaches how to use the elements of standard English, sentence structure, and the parts of speech, and also how to write and revise an essay. This course prepares you to pass the GED Math Exam and reviews and teaches basic arithmetic, algebra, and geometry. You will learn the mathematical concepts and the application of those concepts. This course prepares you to pass the GED Science Exam and reviews Physical Science (physics and chemistry), Life Science (biology), Earth (geology and meteorology), and Space Science (astronomy). This course prepares you to pass the GED Reading Exam, and will teach the student to comprehend and interpret workplace and academic reading selections and to apply those interpretations to new content. This course prepares you to pass the GED Social Studies Exam. It teaches you how to answer questions related to History (United States or Canada & World History), Geography, and Civics.